"40-hour week" redirects here. For other uses, see 40-hour week (disambiguation). Although there were initial successes in achieving an eight-hour day in New Zealand and by the Australian labour movement for skilled workers in the 1840s and 1850s, most employed people had to wait to the early and mid twentieth century for the condition to be widely achieved through the industrialised world through legislative action. The first country to adopt eight-hour working day nationwide was Uruguay. The eight-hour day was introduced on November 17, 1915, in the government of José Batlle y Ordóñez. In Indonesia, the first policy regarding working time regulated in Law No. 13 of 2003 about employment. In the law, it stated that a worker should work for 7 hours a day for 6 days a week or 8 hours a day for 5 days a week, excluding rest periods. The 8-hour work day was first introduced in 1907. Within the next few decades, the 8-hour system spread gradually across technically all branches of work. A worker receives 150% payment from the first two extra hours, and 200% salary if the work day exceeds 10 hours. The first German company to introduce the eight-hour day was Degussa in 1884. The eight-hour day was signed into law during the German Revolution of 1918. In Hungary, the eight-hour work day was introduced on April 14, 1919 by decree of the Revolutionary Governing Council. In Poland, the eight-hour day was introduced November 23, 1918 by decree of the cabinet of the Prime Minister Jędrzej Moraczewski. In 1884, Tom Mann joined the Social Democratic Federation (SDF) and published a pamphlet calling for the working day to be limited to eight hours. Mann formed an organisation, the Eight Hour League, which successfully pressured the Trades Union Congress to adopt the eight-hour day as a key goal. The British socialist economist Sidney Webb and the scholar Harold Cox co-wrote a book supporting the "Eight Hours Movement" in Britain. The first group of Workers to achieve the 8 hour day were the Beckton [ East London] Gas workers after the strike led by the leadership of Wil Thorne, a member of the Social Democratic Foundation. The strike action was initiated in March 31st 1889 after the introduction of compulsory 18 hour shifts, up from previous 12 hours. Under the slogan of " shorten ours hours to prolong our lives" Wil Thorne the strike spread to other gas works. He petitioned the bosses after a strike of some weeks, the bosses capitulated and three shifts of 8 hours replaced two shifts of 12 hours. Wil Thorne founded the Gas workers and general labourers Union, which evolved into the modern GMB union. In 1864, the eight-hour day quickly became a central demand of the Chicago labour movement. The Illinois legislature passed a law in early 1867 granting an eight-hour day but it had so many loopholes that it was largely ineffective. 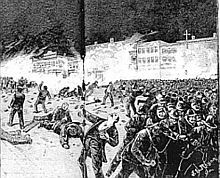 A citywide strike that began on 1 May 1867 shut down the city's economy for a week before collapsing. The Australian gold rushes attracted many skilled tradesmen to Australia. Some of them had been active in the chartism movement, and subsequently became prominent in the campaign for better working conditions in the Australian colonies. Workers began winning an eight-hour day in various companies and industries in the 1850s. ^ Chase, Eric. "The Brief Origins of May Day". Industrial Workers of the World. Retrieved 30 September 2009. ^ "The Haymarket Martyrs". The Illinois Labor History Society. Archived from the original on 9 May 2008. Retrieved 30 September 2009. ^ Marx, Karl (1915). Capital: The process of capitalist production. Translated by Samuel Moore, Edward Bibbins Aveling, and Ernest Untermann. C. H. Kerr. p. 328. ^ Marx, Karl (1867). Das Kapital. p. 376. ^ Neocleous, Mark. "The Political Economy of the Dead: Marx's Vampires" (PDF). Brunel University. Retrieved 7 November 2013. ^ "8時間労働発祥の地神戸" [Kobe: Birthplace of the Eight-Hour Day] (in Japanese). City of Kobe. 6 April 2011. Retrieved 23 March 2017. ^ "Labor Standards Act". Ministry of Justice (Japan). 11 December 2012. Retrieved 23 March 2017. ^ "UNDANG-UNDANG REPUBLIK INDONESIA NOMOR 13 TAHUN 2003 TENTANG KETENAGAKERJAAN" (PDF). ^ "Az ipari munkások munkabérének ideiglenes megállapítása. A Forradalmi Kormányzótanács LXIV. számú rendelete" [Temporary determination of the industrial workers' wages. Decree No. 64 of the Revolutionary Governing Council.]. A Forradalmi Kormányzótanács és a népbiztosságok rendeletei [Decrees of the Revolutionary Governing Council and the people’s commissariats] (in Hungarian). Szocialista-Kommunista Munkások Magyarországi Pártja. 2: 32–33. 1919. ^ Sidney Webb. "The eight hours day". Open Library. Retrieved 14 July 2014. ^ "The New Canadian Ship Railway". Hardware. 10 January 1890. Retrieved 18 April 2013. ^ "United States v. Martin – 94 U.S. 400 (1876) :: Justia US Supreme Court Center". Supreme.justia.com. Retrieved 14 July 2014. ^ "336 U.S. 281". Ftp.resource.org. Archived from the original on 10 March 2012. Retrieved 14 July 2014. ^ Richard F. Selcer (2006). Civil War America, 1850 To 1875. Infobase Publishing. p. 65. ^ "The Lines are Drawn". Chicagohistory.org. Archived from the original on 14 November 2014. Retrieved 14 July 2014. ^ New York Times "[Ford] Gives $10,000,000 To 26,000 Employees", The New York Times, 5 January 1914, accessed 23 April 2011. ^ Ford Motor Company "Henry Ford's $5-a-Day Revolution" Archived 6 May 2011 at the Wayback Machine, Ford, 5 January 1914, accessed 23 April 2011. ^ HispanicPundit "Economic Myths: The 5 Day Work Week And The 8 Hour Day", Hispanic Pundit, 21 September 2005, accessed 23 April 2011. ^ Byron Preiss Visual Publications, Inc. "Ford: Doubling the profit from 1914–1916", Hispanic Pundit, 1996, accessed 24 April 2011. ^ Philip Sheldon Foner (1982). 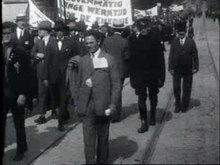 History of the Labor Movement in the United States: 1915–1916, on the Eve of America's Entrance into World War I, Vol. 6. International Publishers Company, Incorporated. p. 196. ISBN 978-0-7178-0595-2. [A] ten-hour center like Bridgeport was converted overnight into an eight-hour community, a result that ten years of agitation under normal conditions might not have accomplished. ^ Jonathan Grossman (June 1978). "Fair Labor Standards Act of 1938: Maximum Struggle for a Minimum Wage". Monthly Labor Review. US Department of Labor. Retrieved 20 July 2010. ^ "National Fair Labor Standards Act". Chron. Retrieved 12 November 2013. ^ Cahill, Rowan. "The Eight Hour Day and the Holy Spirit". Workers Online. Labor Council of N.S.W. Retrieved 1 October 2012. ^ Roth, Bert. "Samuel Duncan Parnell". Dictionary of New Zealand Biography. Ministry for Culture and Heritage. Retrieved 26 February 2013. ^ Bert Roth (1966). "Eight-Hour-Day Movement (in New Zealand)". Encyclopaedia of New Zealand. Archived from the original on 1 October 2012. Retrieved 29 January 2017. This page is based on the Wikipedia article Eight-hour day; it is used under the Creative Commons Attribution-ShareAlike 3.0 Unported License (CC-BY-SA). You may redistribute it, verbatim or modified, providing that you comply with the terms of the CC-BY-SA.